After Chad Crutchfield passed away following a 17-month fight with leukemia, his wife, Andrea, and three young children -- Madison, Nathan and Kahlei -- wanted to do something to honor his memory. They also wanted to help other patients and their families who, like them, had spent an extended amount of time at Mayo Clinic in Florida with little to do but worry. 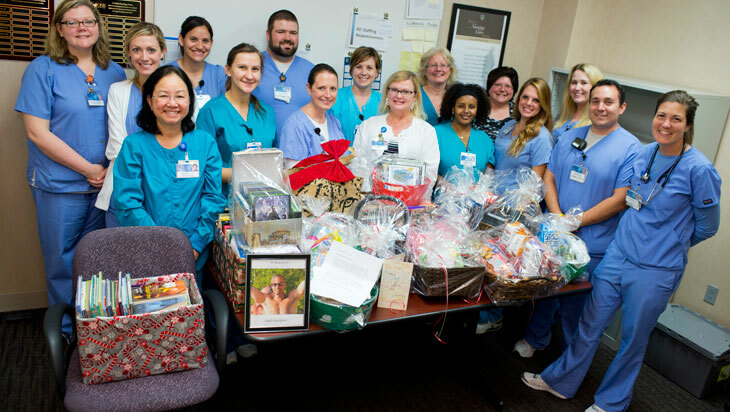 So they recently delivered baskets full of movies, coloring books, crayons, children's books, games, snacks and more for other patients and their families to share and help not only pass the time, but also help take their minds off of where they are and why. If only briefly. "We were always very community-service driven as a family before Chad became ill," Andrea says. "But then, of course, we had to let that go because his illness took over our lives for those 17 months." Soon after Chad's passing, Andrea says she knew it was time to get back into community service again. They started by helping out at local food banks throughout their Florida community over the summer. And it was about that time Madison, the oldest, suggested the family extend their helping hands to Mayo Clinic for the care Chad had received there. 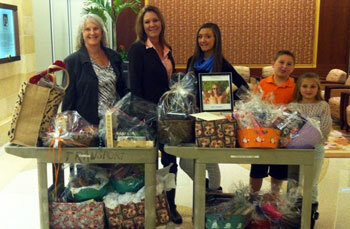 "So we all talked about it and decided to start putting the baskets together," Andrea says. The family began by shopping for items they thought might come in handy and could be easily shared and enjoyed by patients and their families. Andrea also made a quick post on her Facebook page about what the family was doing, and, "Pretty soon," she says, "my garage was filled up with stuff." While the gifts may be meant for others to enjoy, Andrea says the act of gathering and then bringing them to Mayo Clinic also helped the family's healing process. "It's meant so much to my children," she says. "The kids have absolutely poured their hearts into it." It's just their way, Andrea says, of saying "thanks" for the care given to Chad during those 17 long months. "Everyone -- the doctors, the nurses, the whole staff -- I can't even tell you the level of care Chad received and how welcome we felt at Mayo," she says. "They made it feel like we weren't in a hospital environment. It's been very healthy for my family to do this and we couldn't have picked a better institution to have taken care of our loved one." Laura Brown, nurse manager on 3-North, where Chad was a patient, says she and the other caregivers on the floor have been equally touched by the family's donations. "For others who are going through the same process, we're thankful that they'll be able to enjoy and appreciate this kind of giving and support from a family who has been where they are," she says. Andrea says her family is planning to make the gift donations an annual tradition. As is our tradition, we'd ask you to share your comments below.